Firstly wishing everybody a very Happy Dasara/Dussehra/Shubh Biyoya! Nine days of Navratri festivities culminate on the 10th day of Dasara. Nine days of fun, frolic, dressing up in your best, feasting, dancing ends on a spiritual, more quieter note of Dasara. Today is more about prayers and making something sweet to celebrate the occasion. Back home we also have an interesting tradition of distributing Apte Tree leaves or aptyache paan as we call it. This are also called sone or gold. Each leave symbolizes a gold coin and everyone distributes these leaves to their family and friends as a token of spreading prosperity. I don't know the story behind this ritual but i was made to believe as a kid that ancient India used to be so rich that people would actually gift their friends real gold. Wish i was born then! Now we can just afford to distribute Apte leaves as a symbolic gesture and loads of good wishes. We don't get Apte Leaves here in North America so i just made them with some of my daughter's construction paper. It's the thought which counts, right! With pumpkin season going on, i wanted to make a sweet with it. I saw many variations on the internet and created one in my own style. And Boy! i was really impressed. 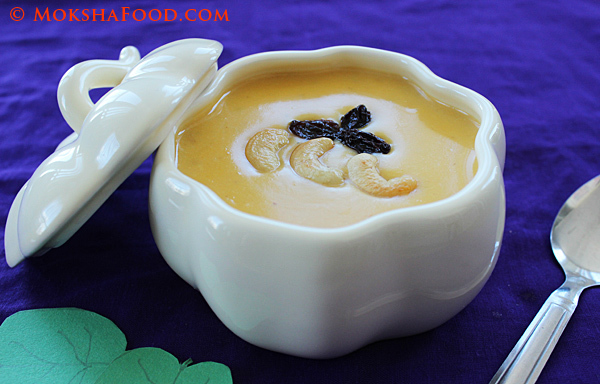 The pumpkin kheer turned out creamy, with just a hint of sweetness and nice crunch from the nuts. The flavor is also not too pumpkiny. Most importantly my daughter loved it so brownie points for adding a vegetable into her tummy. In a saucepan, combine the water and pumpkin and cook it till done. You can also steam the pumpkin as an alternative. Drain out the water. It can be used as a stock for another recipe. 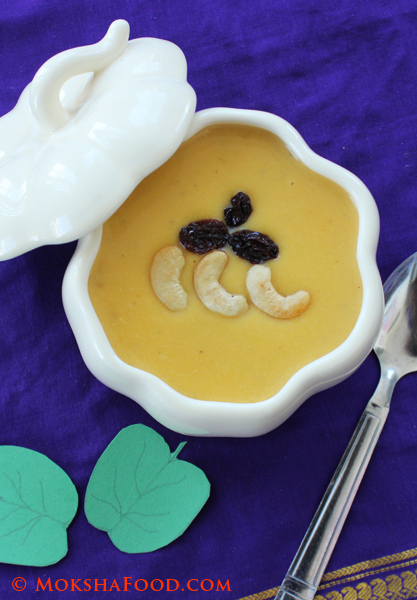 Blend 6-7 cashew nuts and the cooked pumpkin into a smooth puree. Heat up the same pan to medium again. Add some ghee and roast the remaining cashew nuts and raisins till they change color. Remove and set aside. Lower the heat and add in the milk and bring it to a gentle boil. Stir in the pumpkin puree now and mix it well till it becomes a homogenized mixture. Keep stirring to make sure the puree doesn't settle down and burn at the bottom of the pan. Now add in the sugar and stir well till it dissolves. Lastly add in the nuts, raisins, cardamom powder and nutmeg powder. This can be served hot, RT or cold. Taste great as a snack or dessert. Tip: I have also tried this recipe with butternut squash and it works very well with it too. Thanks dear..let me know how it turns out!